How long should I wait after needling acne scar before I inject the saline solution, and, how often can this procedure be done? Also, if I am rolling every 4-5 weeks, when in that schedule should I do the subcision? Last question: May I roll with .25 narrow roller, for product absorption, in-between all of this? Thanks again for your wonderful products and your knowledge-based advice. As far as I remember, you were a nurse trying to perform the saline injection method on yourself? The saline should be injected about once every 2 weeks. 6-8 procedures are normally required to get results. The first test scar: Needle it, wait about 2 weeks, then perform a saline injection every two weeks without additional needling. The second test scar: Needle just before the saline injection to make a pocket underneath the scar for the saline solution. Wait 3 weeks and repeat. 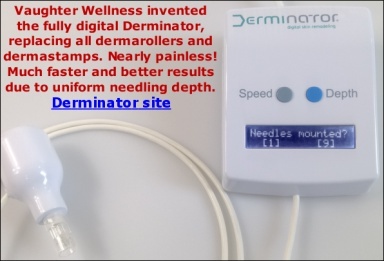 Yes, you can dermaroll with a .25 mm dermaroller in between but do not roll for about 5 days on the areas with saline subcision. Use for example some adhesive tape to lift up the skin. I decided to use the every two weeks schedule for my saline injections, and have good news. After a year of monthly rolling with a 2 mm roller with needling, and 2 saline injection treatments (2 wks apart), I am seeing improvement as evidenced by the fact that it is becoming more difficult to find the scars I intend to inject. I never thought that would happen! The scars' borders, which were at one time very distinct, now are much softer, with some being difficult to see except with bright light. I intend to continue to attempt the injections every 2 wks for 12 more wks, and intend to continue the rolling for another year, with the goal of someday being able to go make-up free!!!!! I would love that! Please keep us up-to-date. It would be esp. interesting to see how the end result will be (after having stopped saline injections for say half a year). Forgot to mention that I had used the 1.5 mm derma stamp on scars last time I rolled entire face. Will I disturb any of the progress I have made if I use the stamp on the scars I have been injecting? I will be rolling my entire face approximately one week after these latest saline injections. Thanks again for your patient guidance. I 'm not sure, because the combination of saline injections and dermarolling is pretty new and you basically have to use the try-and-see method. I think that dermastamping the injected areas one week after is too premature and you should wait longer. The process triggered by saline injections underneath the scar is not finished by far after just one week. The whole point of it being to release the fibrous strands that hold the scar down, and to trigger more collagen. (Do a test scar with dermastamping as you suggested and you will see how it turns out). Let us know. In order to cut down on the weekends I am stuck at home due to having done procedures on my face, do you think I could do the derma rolling, derma stamping and needling, and then do subcision on my deep scars, all in one long session, with the sessions being about 4-5 weeks apart? Do you think that would be too much for my facial skin to endure in one sitting? Thanks, as always, for you learned and thoughtful advice!!! You should be able to do it all it all in one go - but be meticulous about disinfection. I have breast implant crease scars and am interested in having them be invisible as possible (one scar is too low and on my chest). I have no fear of needles and would like to try the saline injections. What size/gauge needle/syringe do you recommend and how much saline solution to be injected? Do you barely pierce the skin and inject section by section along the 3 inch scar? Is any OTC saline alright to use?